When the heart isn’t beating properly, then it may not be pumping blood properly. And without regular blood flow, your other organs may not function properly. Those all-important heartbeats are caused by electrical impulses that keep the heart beating to a healthy, even rhythm. When the heart beats out of that rhythm, either too slowly, too rapidly, or erratically, cardiac arrhythmia develops. Arrhythmia is any change in the normal sequence of the heart’s electrical impulses, which can lead to sudden cardiac arrest or a stroke. How does electrophysiology treat it? At Arkansas Heart Hospital, our Heart Rhythm Institute and its cardiac electrophysiologists work with patients to prevent and treat arrhythmia, along with the other heart issues that can occur as a result. Electrophysiology (EP for short) measures the electrical activity in your heart, evaluating those electrical impulses that keep the heart beating. Our electrophysiologists not only track irregular heartbeats, they also determine the cause of the issue and how to safely get the heart back into normal rhythm. 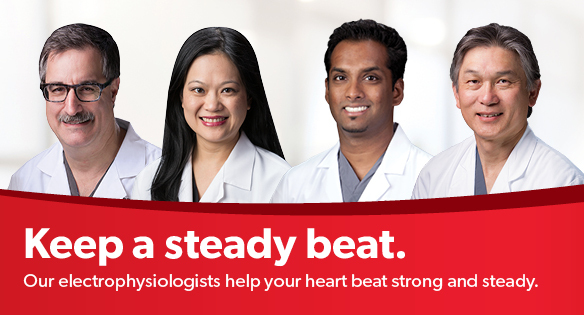 Our team of four physicians have served numerous patients, combining their cardiac expertise with state-of-the-art technology to assess, treat and prevent a variety of heart rhythm disorders. To learn more about electrophysiology services at Arkansas Heart Hospital or to schedule an appointment, please call us at 501-219-7000. From admission until discharge, patient care focuses on personal needs, comfort and convenience.